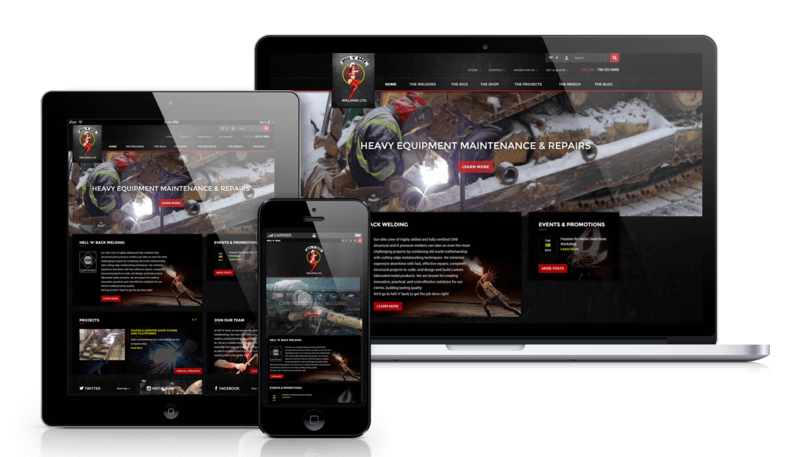 Hell N Back Welding Inc - Illusive Design Inc.
Hell-n-back is a WordPress-based e-commerce site offering portable welding services. Hell-n-back’s highly experienced staff maintains an expertise across a wide range of different uses and products. Originally designed via WordPress and still based in its interface, Illusive Design oversaw a full revamp of its website to incorporate several different new features that resulted in Hell-n-back gaining increased exposure for their business and seeing a vast increase in website traffic. 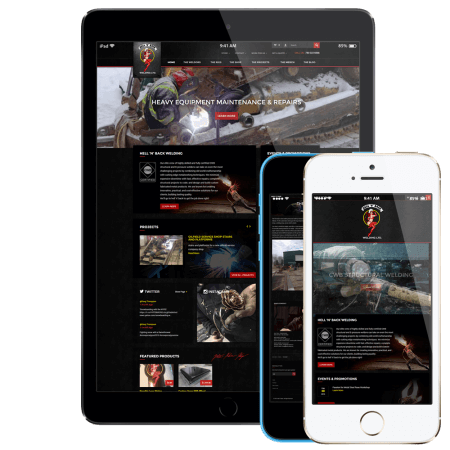 The fully responsive design is optimized to be viewed on any device – whether that’s a laptop, a tablet, or a smartphone. Furthermore the handheld device design worked to automatically adjust its pages in order to save the visitor battery life and processing speed. These user-friendly designs helped connect with a greater number of visitors, keeping them on the site for longer and served to enhance the site’s navigational experience. The site benefited from a fully integrated e-commerce interface that spanned multiple categories and featured simple payment options via PayPal. This interface is equipped with the latest internet security technologies ensuring that Hell-n-back’s customers are appropriately protected throughout the payment process. The aim through Hell-n-back’s easy-to-use e-commerce design is to successfully encourage visitors to purchase in the moment – a target we successfully hit. 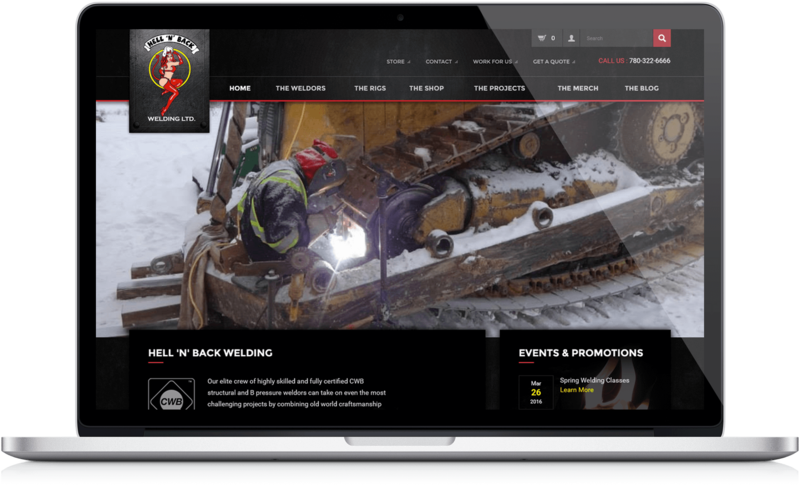 Hell-n-back’s strengths are through their ability to instantly connect with their target audience based off of their visual marketing and the interactive features incorporated into the site’s design. Hell-n-back provides an online pin-up contest that appeals to their customer base and encourages them to re-visit the site on a monthly basis. The design is complete with a custom quote form as well as custom content types for projects with a drag-and-drop timeline gallery. We have used Illusive Design to maintain our website for several years. They are responsive, fast, and excellent at what they do. We have received nothing but compliments on our new website and we have already noticed a better Google ranking. We highly recommend Illusive to anyone looking for a website design company. Through facilitating an effective revamping of Hell-n-back’s existing site, we successfully increased the site’s website traffic by more than 100%. Through incorporating search engine optimization strategies, the Hell-n-back website was moved from Page 3 in Google search engine rankings to Page 1 within a six-month time frame. With a fully custom design, the Hell-n-back brand grew significantly in their initial months with Illusive Design, and they continue to see the effects of our hard work and dedication as they serve to continue their growth in the coming months.